Sarah joined AEC as a Licensed Veterinary Technician (LVT) in 2017. She graduated from Baker College of Flint in 2011 with an Associate of Applied Sciences (Veterinary Technology) and has a variety of veterinary experience. 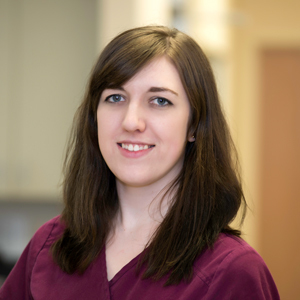 Sarah worked for over 5 years at a Michigan based Small Animal general veterinary practice. She also spent one year working at the Veterinary Center for Birds & Exotics in New York before moving back to Michigan to specialize in emergency work at AEC. "I chose this career because I always wanted to work with and help animals. I hope that I can bring a little deeper avian & exotic knowledge to AEC and our clients so we can give their pets the best care possible!" Sarah has a special interest in exotic pets, having owned many herself. She currently has two rabbits named Lindsay and Emmett, and a rat named Splinter!